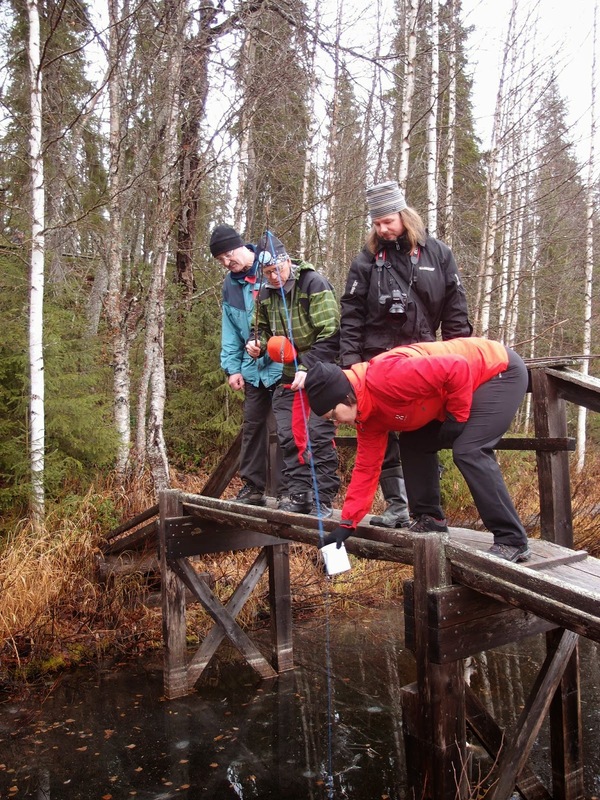 On Wednesday, the staff of Sodankylä Geophysical Observatory spent a recreational day in Ahvenlampi, in Luosto. In Finnish, this is called virkistyspäivä. Weather permitting, outdoor activities are particularly popular in all seasons for such occasions. Luckily, this was a dry day with slightly positive temperatures, which was particularly well suited for a treasure hunt designed in the same spirit as geocaching during the morning. The staff members were divided into three teams and had to find hints hidden around the pond. On their way, they collected sausage sticks, blue wool thread and some metal wire, which they needed to use to "fish" one of the last hints. Team work was strongly required to collect the final box containing the indications to find the treasure, which consisted in tikkupulla dough and The Password for lunch. 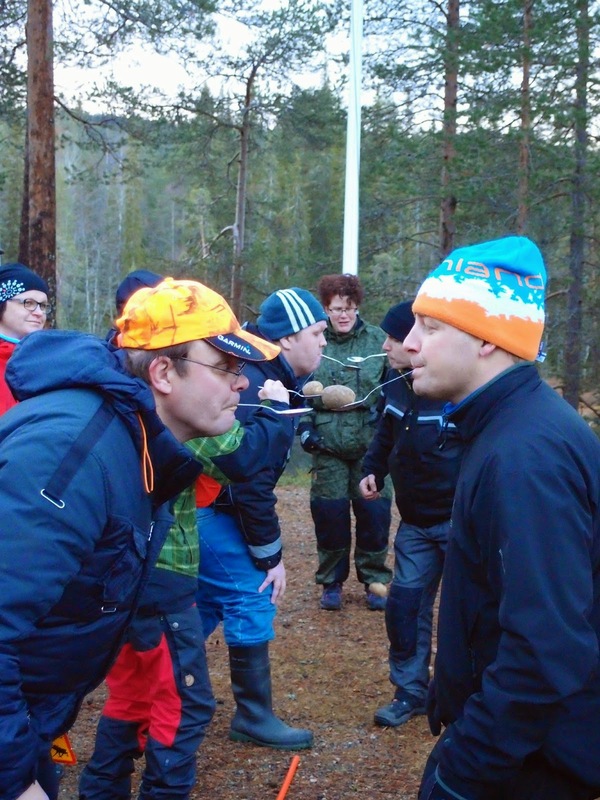 During the afternoon, the teams took part in a competition including several activities such as rubber boot throwing and a potato-in-a-spoon-in-the-mouth relay race. 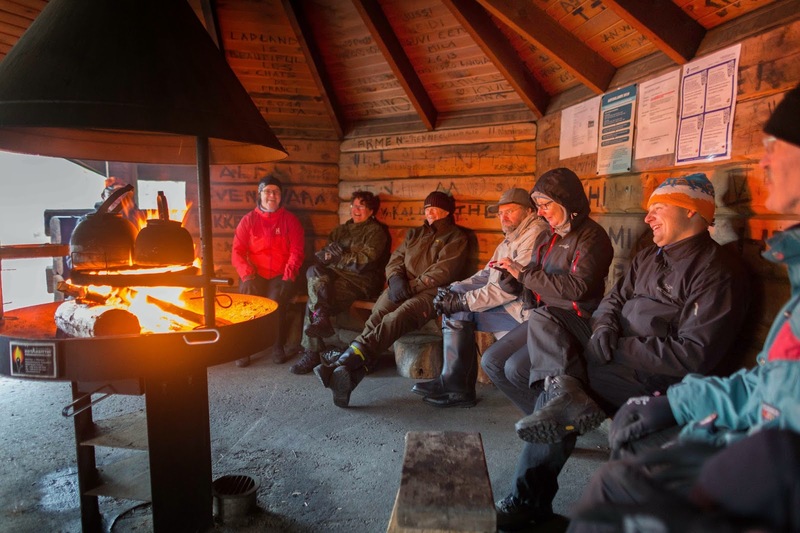 After the competition, the participants all went to the laavu where they had coffee and made the tikkupullat ("stick buns", cooked above the fire). The final task consisted in a quiz about the observatory staff members, after which the points earned by each team were counted. This was a really pleasant and refreshing day, for which we warmly thank the best organiser ever, Iina Sirviö, who did a great job to make this event so memorable! SGO:n kamerat on kuvanneet Lapin taivasta noin kahden kuukauden ajan ja taivaalla on nähtävää riittänyt 70% öistä. Yleensä syys-lokakuu on pilvistä ja sateista aikaa, mutta tänä syksynä ainakin Lapissa on riittänyt ihan hyvin selkeääkin säätä revontulien havainnointiin. 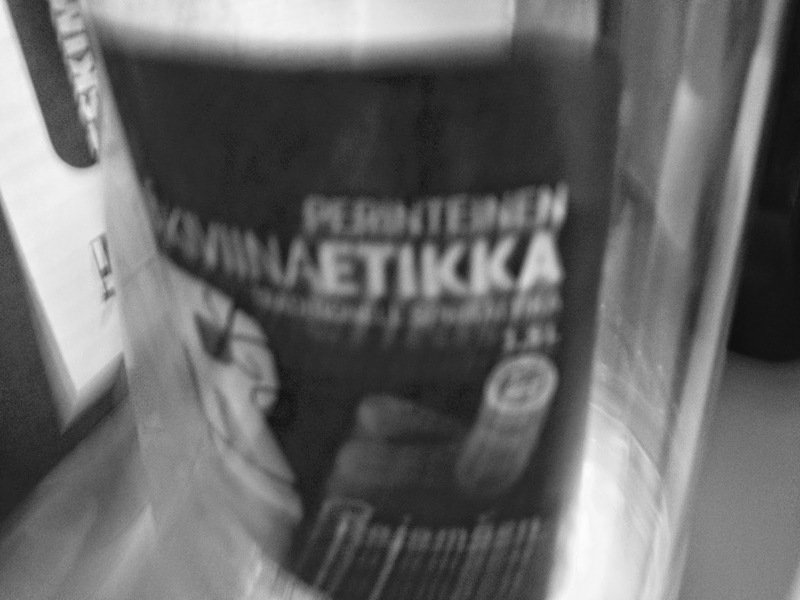 Varsinainen pimeän aika kestää jo 13 tuntia päiväpituuden jäädessä Sodankylän korkeudella alle 8 tunnin. Talviaikaan siirtyminen myös helpotti iltaunisten mahdollisuuksia nähdä revontulia. Alla koko viime yön revontulet, jotka päättyivät sykkiviin revontuliin aamun sarastaessa puoli seitsemän aikaan. Syksyn revontuliyöt löydät SGO:n galleriasta aina 27.-28.10. yöhön saakka. Euthanasia, animal testing, biofuels, Milgram experiment... Although in physics we do not have the same ethical issues as in biology, medical science or psychology, there are quite a few situations a physicist encounters in his scientific life which require being careful, be it while processing data, publishing a paper or making public statements. This blog post itself has been ethics-checked with the utmost care and contains no plagiarism nor bear any kind of conflict of interest. In the University of Oulu, all the doctoral students are required to take a Scientific Research and Ethics course during their PhD. For some of them, it is a topic they never dealt with before. This course consists of a couple of general lectures introducing the concept of ethics from a philosophical point of view, followed by several field-specific lectures. 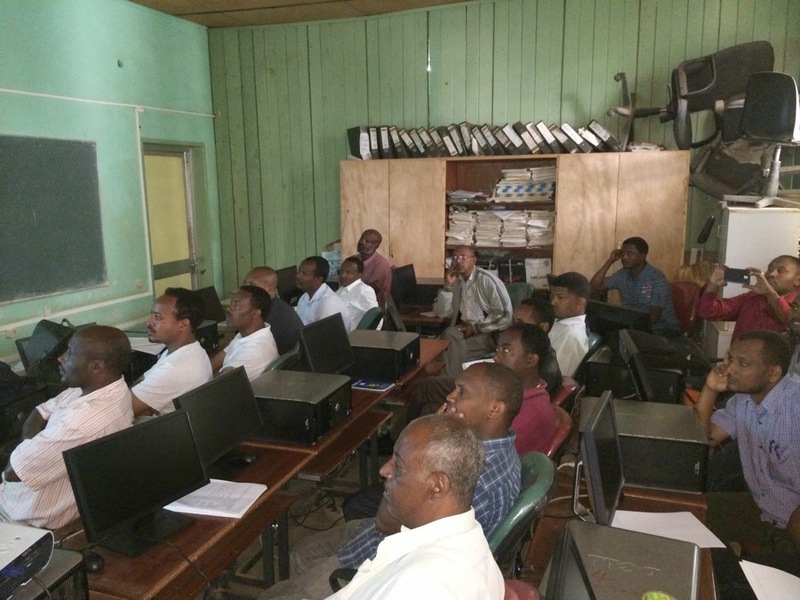 This enables to treat differently the students in medicine or biology who may open people or animals to publish scientific papers, students in humanities who may make statistics from personal data to publish scientific papers and students in physics or mathematics who may publish scientific papers. Finally, a group work on a research-ethics-related topic and leading to a presentation during a seminar allows the students to think by themselves about what ethics involves, based on a concrete case. And for those students who may fail this ethics course in this autumn term, another one will be held next spring. In Finnish. Lesson no. 1: don't mix it with vinegar. 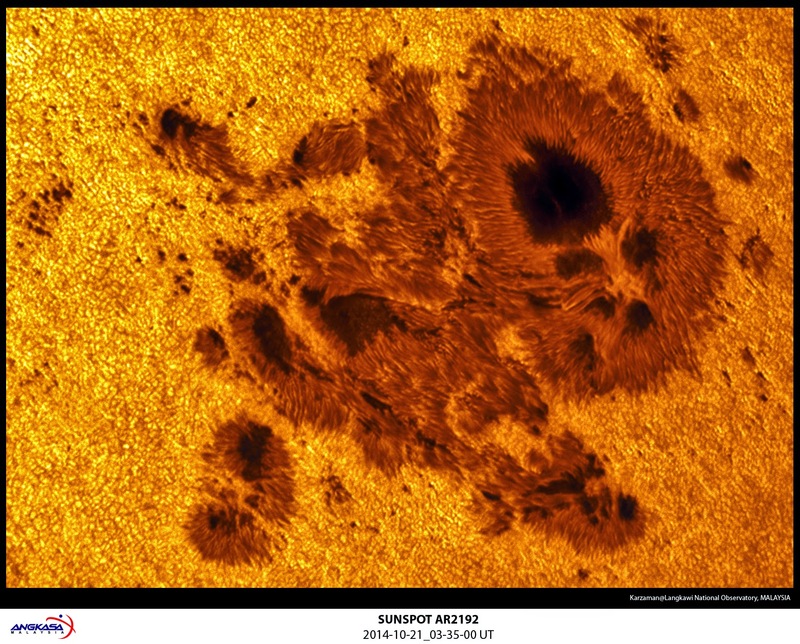 There has been quite inspiring buzz in the media about the current "monster sunspot", and indeed, this giant AR2192 spot has sent multiple X-class solar flares towards us within the past few days. In addition to the widely reported HF-radio blackouts and GPS navigation disturbances, the energetic solar flares cause changes in the upper atmosphere/ionosphere due to increased photoionisation in the whole dayside hemisphere. SGO aims to quantify this ionisation by several ground-based measurement techniques, including riometers. 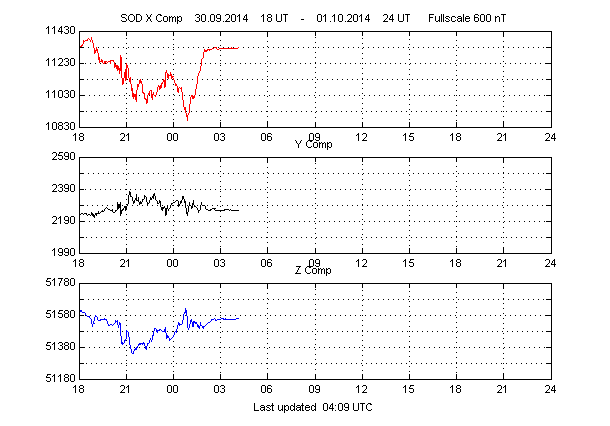 Received power (in arbitrary dB units) detected by the BDU spectral riometer (start, max and stop times of the solar flare event are marked as dashed lines). One of the challenges in detecting the solar flare induced ionisation by riometry is that the Sun sends, not only the X-rays, but also bursts of radio emissions related to the flare events. As the riometer operates at the same radio frequencies, these emissions might mask totally the signature of the atmospheric response to the flare, i.e., reduction in the cosmic radio noise levels. 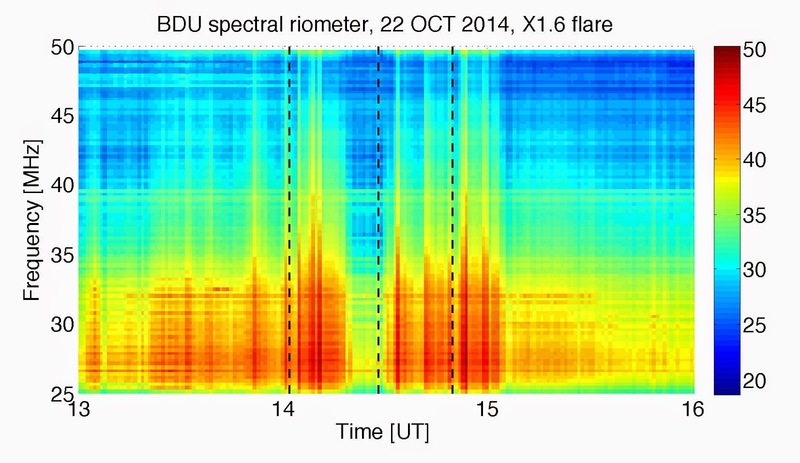 In this case too, the increased levels of radio noise (red stuff) during the onset and offset phases of the flare are probably caused by the direct solar radio emissions. 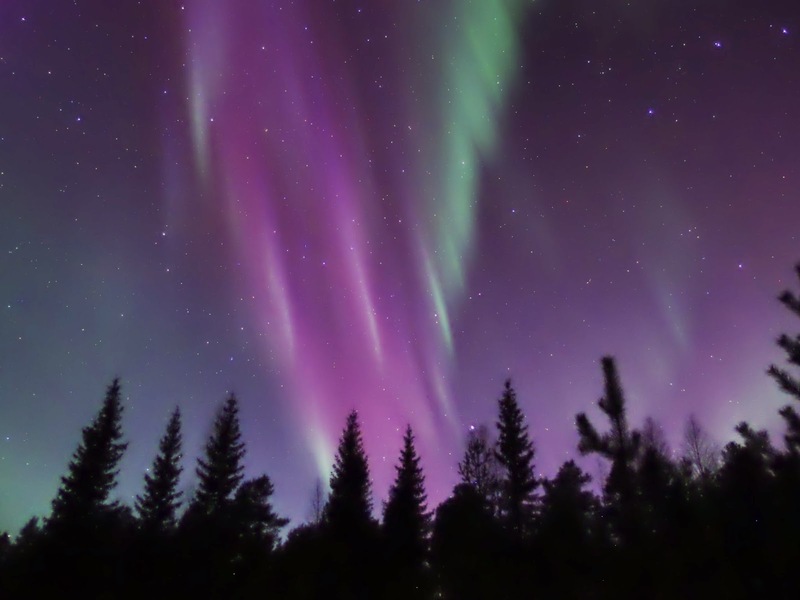 However, around the maximum time of the flare, there is a clear reduction in the radio noise, most likely caused by increased radio wave absorption in the ionosphere. 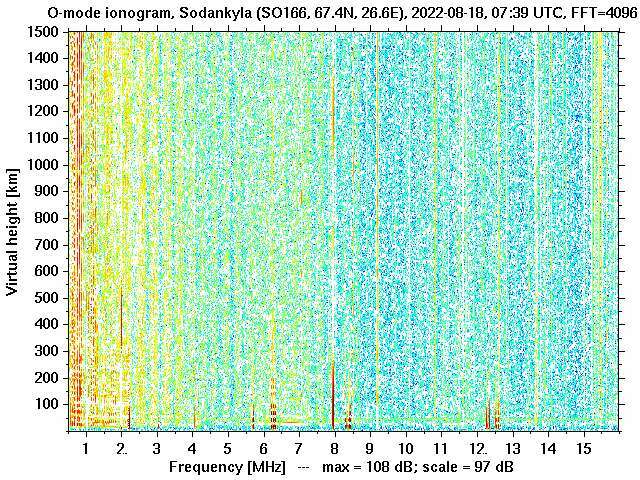 We are particularly interested in the spectrum of this increased absorption (radio noise absorption at different frequencies) as it carries information on the ionisation profile in the atmosphere. This provides a very nice science case for collaboration between the SGO and BDU scientists and pretty awesome kick-off for this instrument, I'd say! 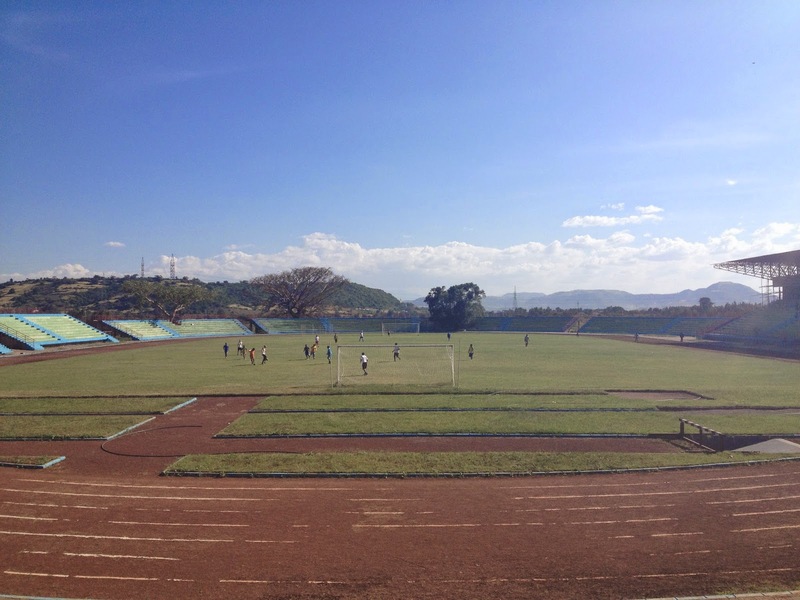 The 'classic' football match, Ethiopia vs Finland took place on Saturday afternoon in the Bahir Dar University stadium. 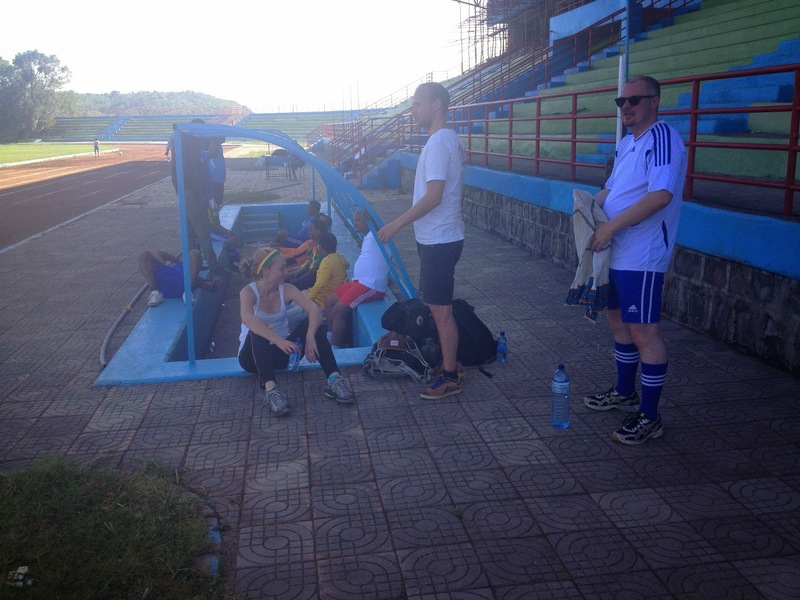 Ethiopia scored 6 times, and Finland 4 times, hence, the better team won. This was the 4th match in row since 2011 and the all-time score is for Ethiopia 3-1! This is a great tradition and a nice weekend entertainment. 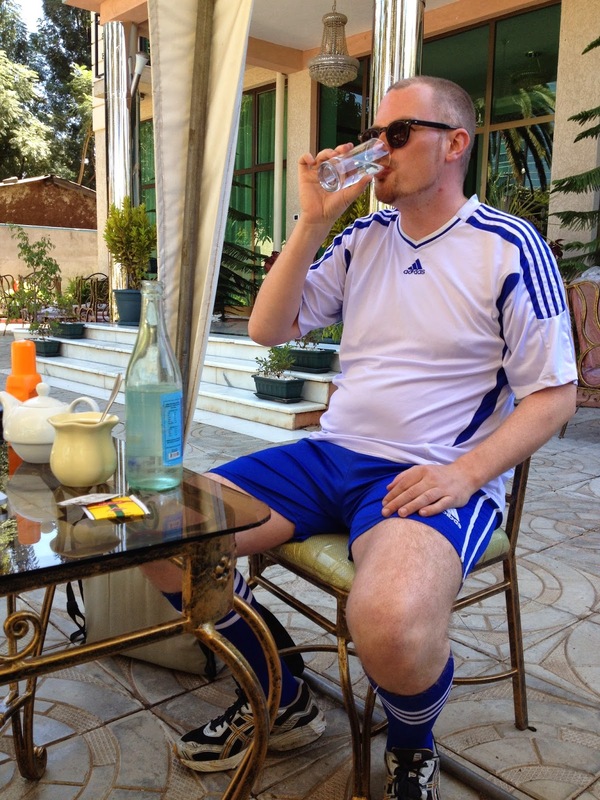 I am sure that Finland will win next year ;) !! 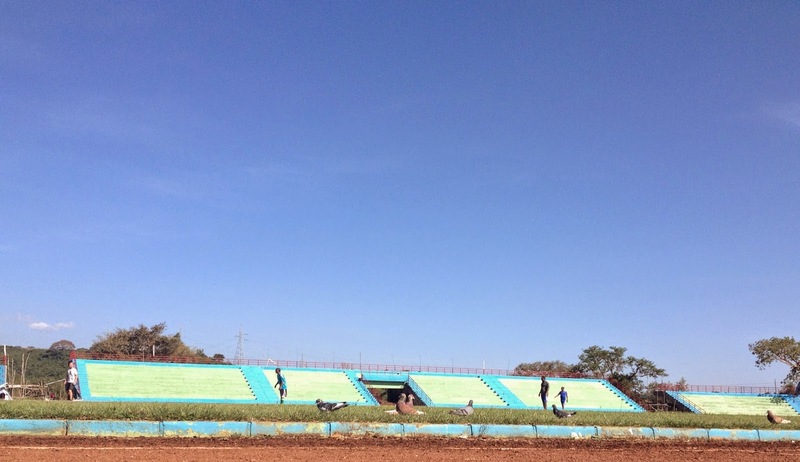 ... and here's the stadium and match in progress. The EISCAT Scientific Association invites applications for observing time on the EISCAT facilities in 2015, by individual scientists, research groups, and consortia throughout the world on equal, competitive basis. This means that anyone can apply, independent of whether or not the applicant is from an EISCAT associate country. The present call is the first one for 2015. In total, 200 hours of experiment time are open for international, peer-reviewed competition, and are available for the use of any of the current EISCAT facilities. Roughly half of this time has been allocated in the first call. For more information, please refer to the EISCAT Peer-Review Programme: Call for Proposals. The deadline for proposals is 1st November 2014 at 24:00 UTC. 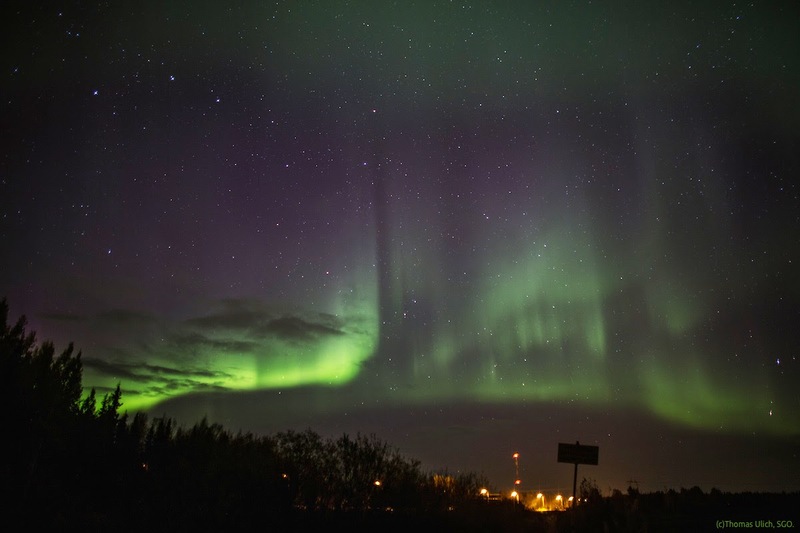 Photo taken just outside the feeder bridge of the EISCAT VHF Radar in Tromsø by Thomas Ulich. 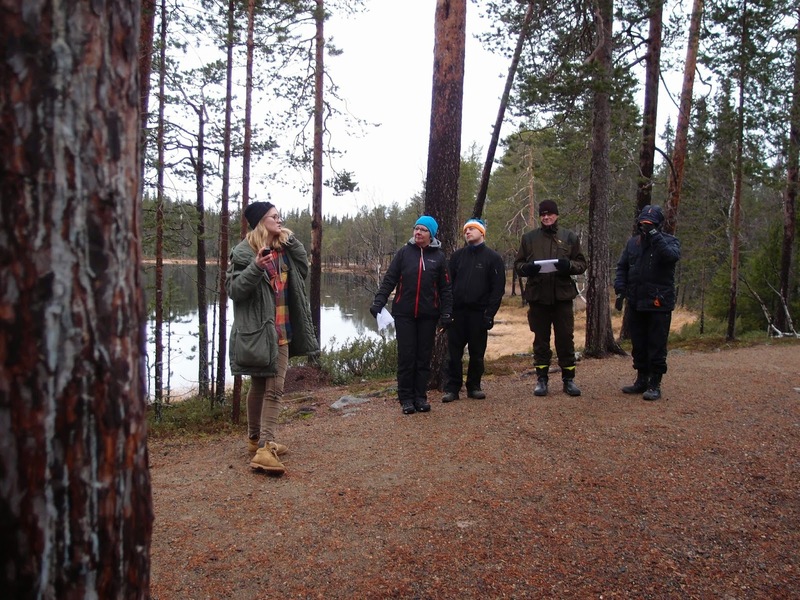 Voici un premier article en français sur ce blog, afin de présenter l'Observatoire Géophysique de Sodankylä (en finnois Sodankylän Geofysiikan Observatorio, d'où l'abréviation SGO) à nos visiteurs francophones qui ne le connaissent peut-être pas. Cet observatoire a été créé en 1913, avant même que la Finlande ne déclare son indépendance de l'Empire Russe (6 décembre 1917). Il se situe 120 km au-delà du Cercle Polaire Arctique (67°22'N, 26°38'E en coordonées géographiques), région où l'activité géomagnétique est particulièrement importante. Les premières mesures du champ magnétique terrestre ont débuté en janvier 1914, et c'est désormais un siècle d'observations qui ont été accumulées. La seule discontinuité dans ces mesures de champ magnétique s'étend de l'automne 1944 à la fin de l'année 1946, lorsque l'observatoire fut brûlé à l'instar de la quasi totalité des constructions en Laponie par l'armée allemande (Guerre de Laponie). 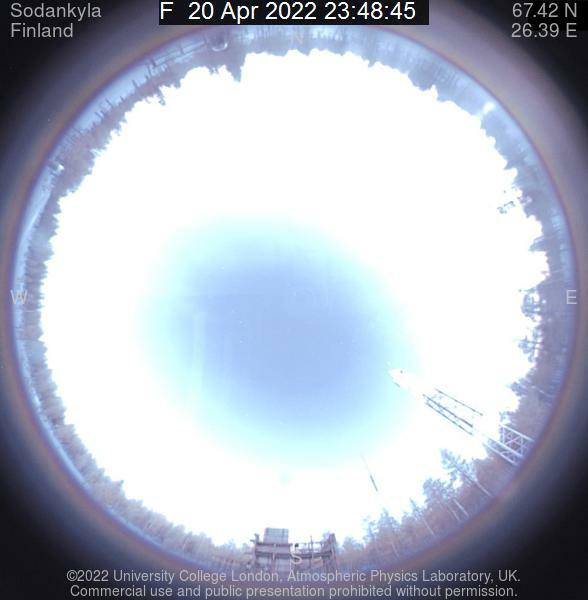 Depuis 1997, l'observatoire de Sodankylä constitue un institut autonome de l'Université d'Oulu, et une partie des chercheurs de l'observatoire travaillent à Oulu. Des liens de collaboration étroite existent par ailleurs entre SGO et certains départements de l'université (physique et mathématiques, en particulier). L'observatoire poursuit deux objectifs principaux : effectuer des mesures géomagnétiques de qualité pour la communauté scientifique et mener une activité de recherche. Parmi les instruments opérés par SGO, on peut mentionner des magnétomètres, une ionosonde, un réseau de riomètres, un radar à météores, une chaîne d'antennes réceptrices de tomographie ionosphérique, un réseau de sismomètres, des antennes VLF, des caméras plein ciel… Plus récemment, l'observatoire a développé un tout nouvel instrument à Kilpisjärvi, KAIRA, offrant de multiples possibilités d'études de la haute atmosphère. 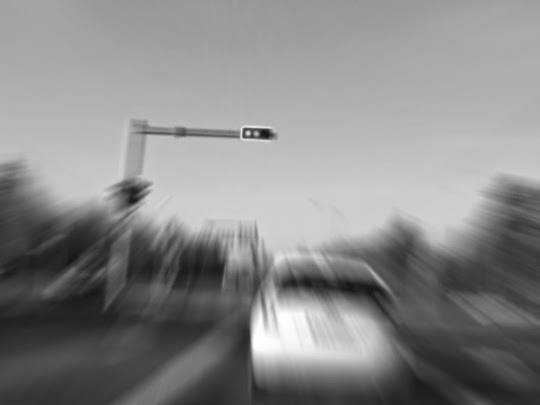 Enfin, SGO est un acteur majeur du développement et de l'exploitation de radars à diffusion incohérente via l'association EISCAT. Les travaux des chercheurs de l'observatoire portent non seulement sur la physique ionosphérique et la météorologie de l'espace, mais aussi sur la sismologie ou encore les rayons cosmiques. De nombreuses collaborations sont entretenues, tant à l'échelle nationale (entre autres avec l'Institut Météorologique Finlandais) qu'avec des équipes à l'étranger (Russie, pays scandinaves, Royaume-Uni, États-Unis, France…). Après ce bref tour d'horizon, un conseil pour les traqueurs d'aurores de passage dans la région : vous pouvez surveiller en temps réel les images prises par les caméras plein ciel ! 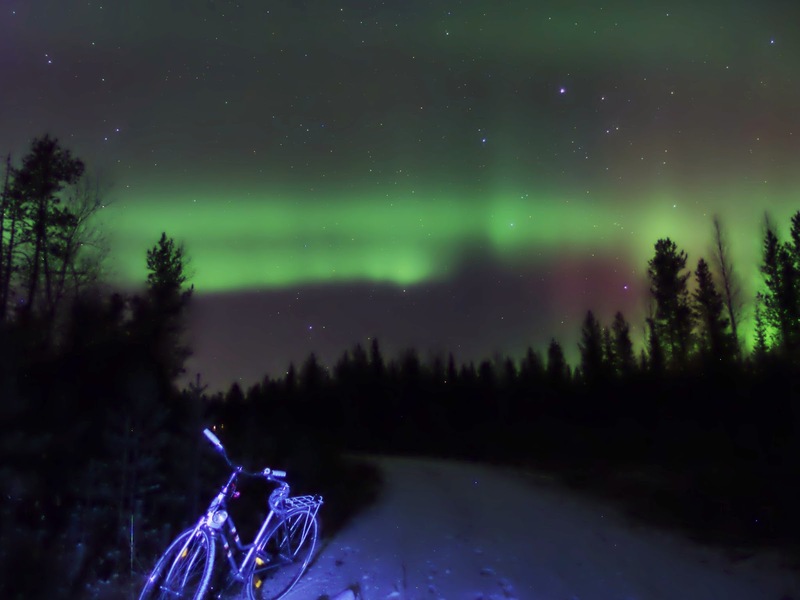 Another active night in Sodankylä this autumn! 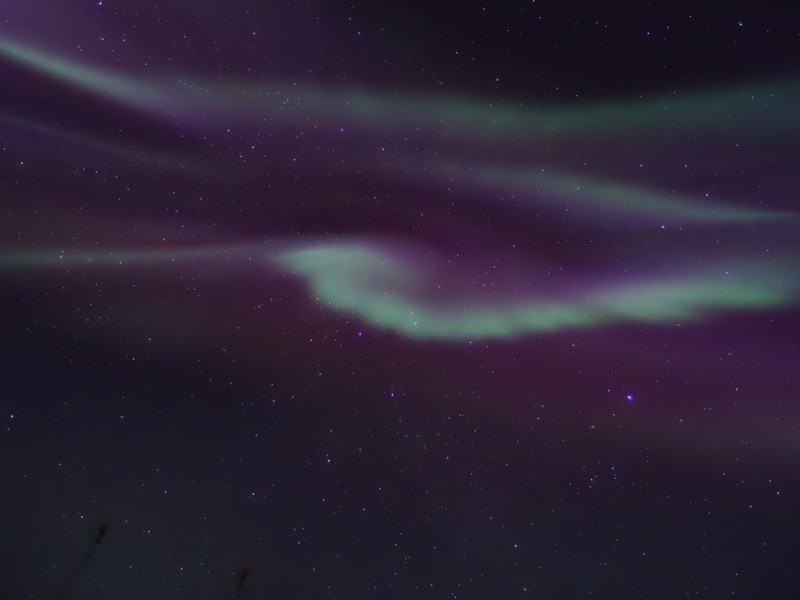 Wonderful displays started to show up as early as 20:00 Finnish time. 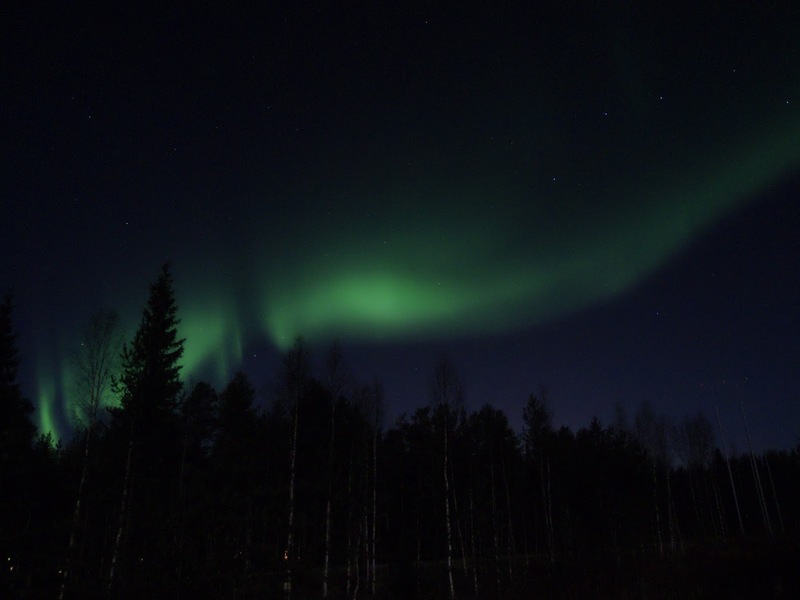 The following pictures were taken between 20:00 and 23:00 near the small airport of Sodankylä. 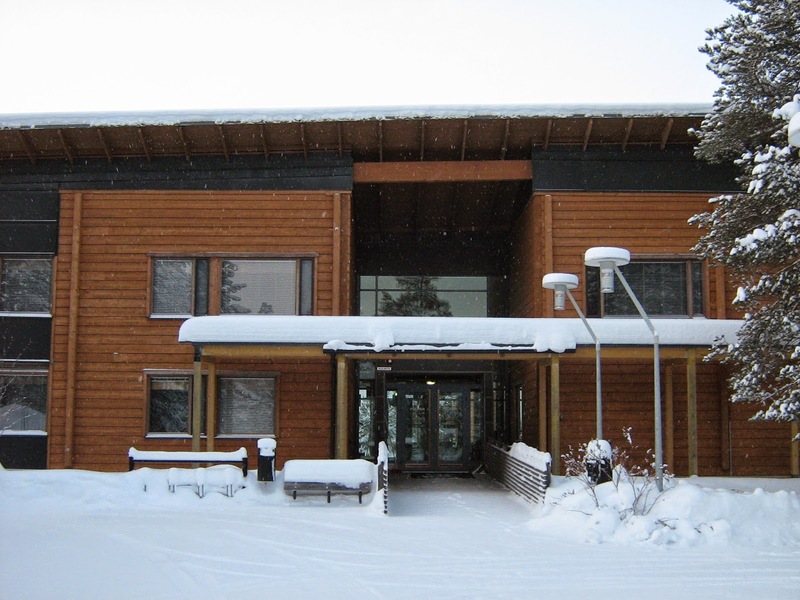 The Observatory Days 2015 will take place 7th to 9th January 2015 at Sodankylä Geophysical Observatory. The purpose of the Observatory Days is to discuss, in a somewhat informal setting, science and future strategies and actions related to space research. Naturally this includes the presentation of recent results and recent, current as well as future activities. The schedule of the meeting is designed to allow for plenty of discussion time. 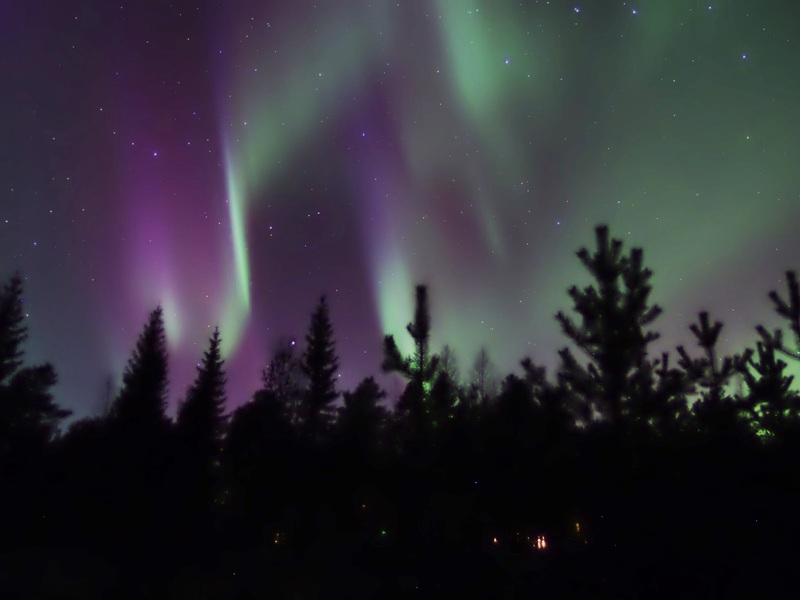 This meeting is the 6th in the current series, which started in 2008 under the name of Sodankylä Science Seminar, and later simply Sodankylä Seminar. 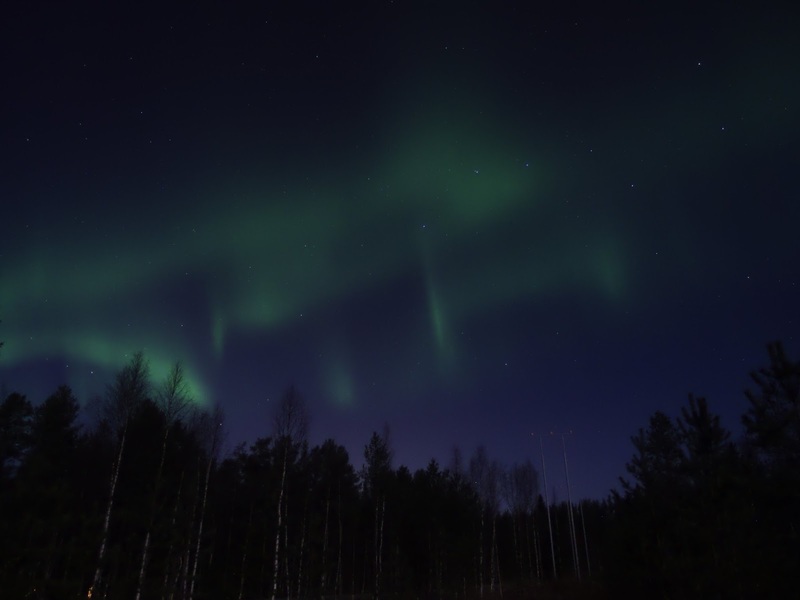 Initially it was meant to discuss collaboration between SGO and the Space Physics Group at the main campus of the University of Oulu, but gradually the meeting expanded and since the 2014 meeting it is open to anyone. For the 2015 edition we decided to change the name to Observatory Days. 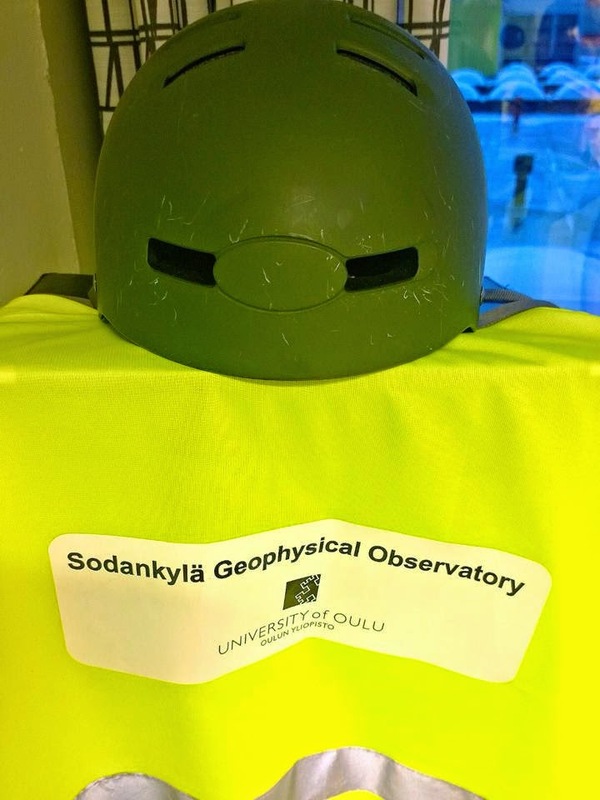 This name has a long history, since there used to be a regular collaboration meeting between the University of Oulu, the Finnish Meteorological Institute, and SGO under the name of "Geofysiikan Observatoriopäivät," which were held before SGO became and independent department of the University of Oulu. The last meeting was the XXVIII Geofysiikan Observatoriopäivät, which took place 11th to 12th January 1993. Already then, the time very early in the year was chosen in order to allow our colleagues with teaching duties to take part in the meeting before the end of the Christmas & New Year break. 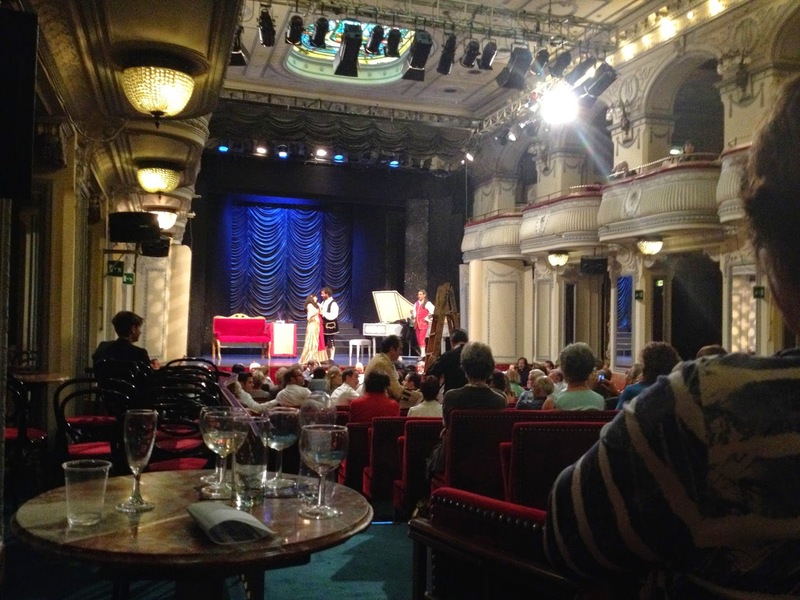 The 2015 meeting will begin at 13:30 LT on Wednesday, 7th January, and end with lunch at 12:00 LT on Friday, 9th January. Deadline for registration and abstract submission: 7th December 2014. 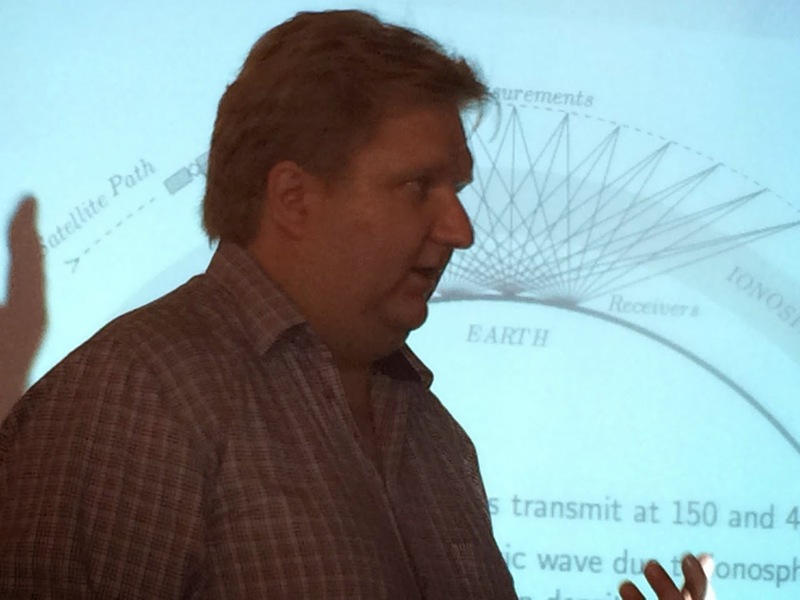 I had a privilege to visit the Leibniz Institute of Atmospheric Physics (IAP) and its radar group for the past week. Sincere thanks to Prof. Koki Chau for the invitation! IAP is one of the world leading research institutes in middle-atmospheric studies by means of radars, lidars and rockets, i.e., there's plenty of common ground for collaboration with SGO. 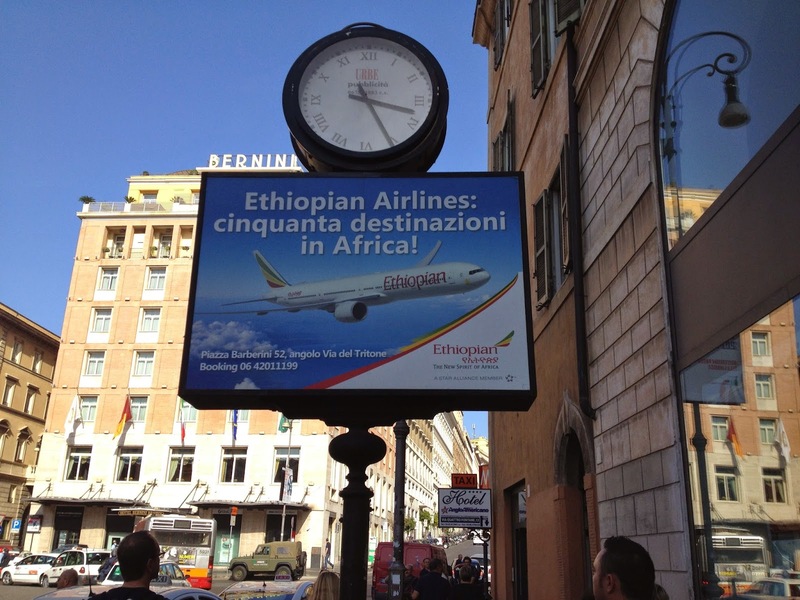 The next stop: Bahir Dar, Ethiopia! Finally another photo taken at a different location in Sodankylä, on the banks of the river Kitinen. 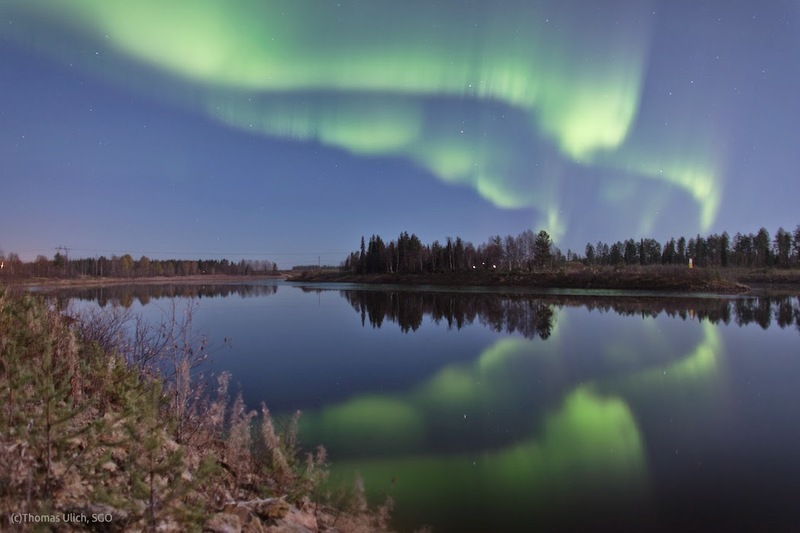 The landscape is eerily bright thanks to the near-full moon, and the lack of wind turned the river into a perfect mirror for northern lights! Photos: Maxime Grandin (top three photos) and Thomas Ulich (bottom photo). L. Roininen, S. Lasanen, M. Orispää and S. Särkkä: Sparse approximations of fractional Mat\'ern fields is available at http://arxiv.org/abs/1410.2113. Please note that this paper is not peer-reviewed. The paper has been submitted for peer-review process in Inverse Problems and Imaging. Now, you may wonder why people want to make submissions before the paper has been accepted. There are several cons in this kind of situations, e.g. the paper may not qualify the peer-reviewing. However, if a paper has a significant breakthrough, it is important to get the paper public early. Especially this is the case when several persons are attacking a similar/same question, it is important that unofficial channels can be used, and hence to clearly demonstrate who was the original person making the claim/theorem/lemma. Hence, ArXiving by submission is typical in mathematics and similar fields. Hence, we emphasise that ArXiving upon submission is highly field-driven. The full report available here! The report has been written by Mikko Orispää, Ilkka Virtanen and Markku Lehtinen. 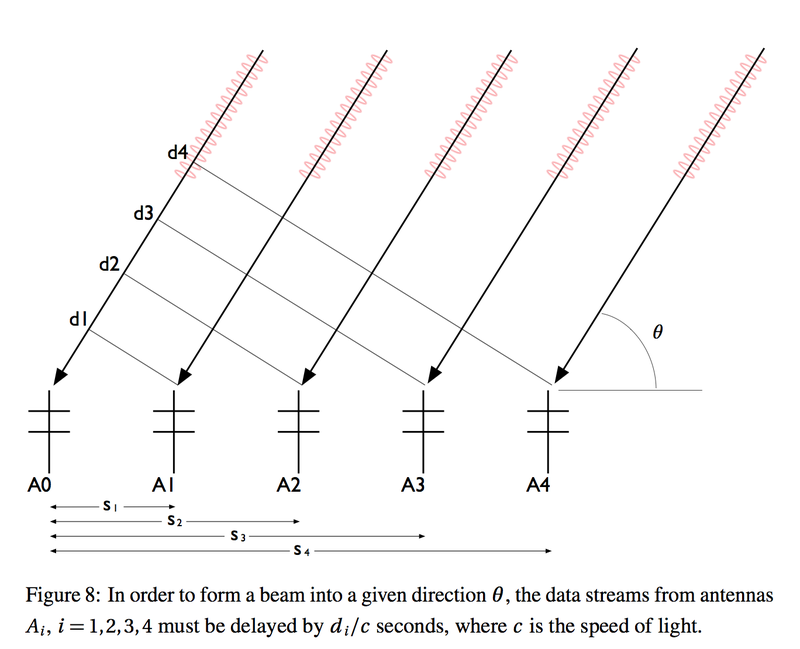 A significant output of the EISCAT_3D preparatory phase project, the "EISCAT_3D Measurement Methods Handbook" by Professor Markku Lehtinen is now online here. The purpose of this handbook is to define the guidelines for the EISCAT_3D radar development project. Incoherent scatter radar experiment design and data analysis is in the process of being transformed from a collection of engineering recipes to an exact mathematical problem in experiment comparison and statistical inversion theories. Also, the development of the solid-state UHF power transmitter technology has lead to a replacement of high-power transmitters and large disc antennas by arrays of several thousands or tens of thousands of simple, relatively low-power transmitters and receivers with phase control for beamforming in both directions. Our goal is to show how the new mathematical principles of radar experiment design and data analysis can be used to design a modern radar representing the true state-of-the-art in both theoretical developments in radar experiment design and modern electronics. We also include the phased-array principle as a new chapter in rigorous radar experiment design, so that the large antenna arrays can be optimised to provide the best possible performance with the least possible cost. The main principle here is to introduce rigorous mathematical principles to replace numerical simulation comparisons wherever possible. This is very useful, because the number of combinations of different alternatives is so large that finding the best ways to operate is practically impossible through simulation comparisons (the search space of all alternatives is simply much too large). This is of course not possible in every respect, but we have succeeded in many sub-problems so that we are very close to the situation of being able to choose the best possible experiments and radar hardware configuration through systematic reasoning – with radically reduced assistance of computer searches optimising different alternatives. In the traditional radars, the (multi)megawatt transmitter systems with discs of several tens of metres of diameter, the cost of signal processing is typically a rather trivial small fraction of the total cost of the system. 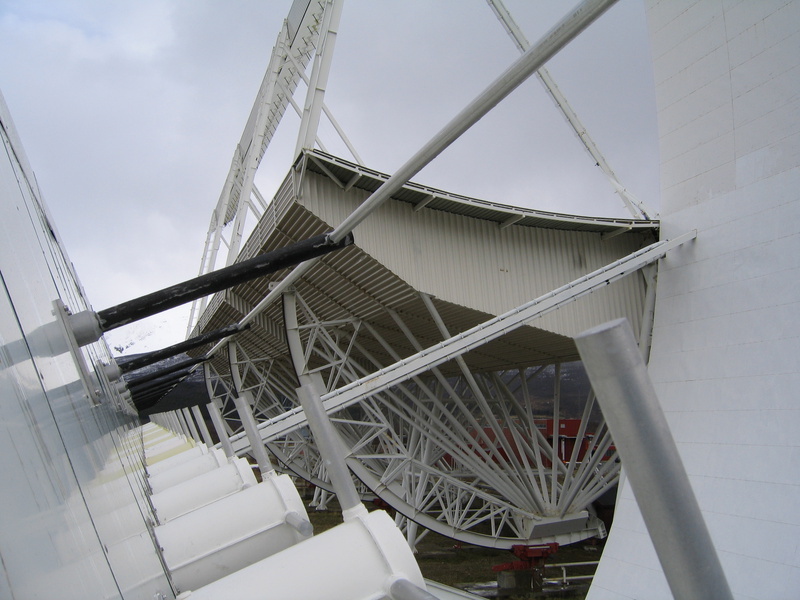 In phased-array systems with tens of thousands of sampled data streams and beamforming by digital computation instead of the analog summation inherent in the very basic principle of operation of the parabolic disc antennas, the cost of signal processing becomes significant. The most obvious cost is that of the hardware of tens of thousands of sampling systems and the related first phases of signal processing, including IQ detection and beamforming. 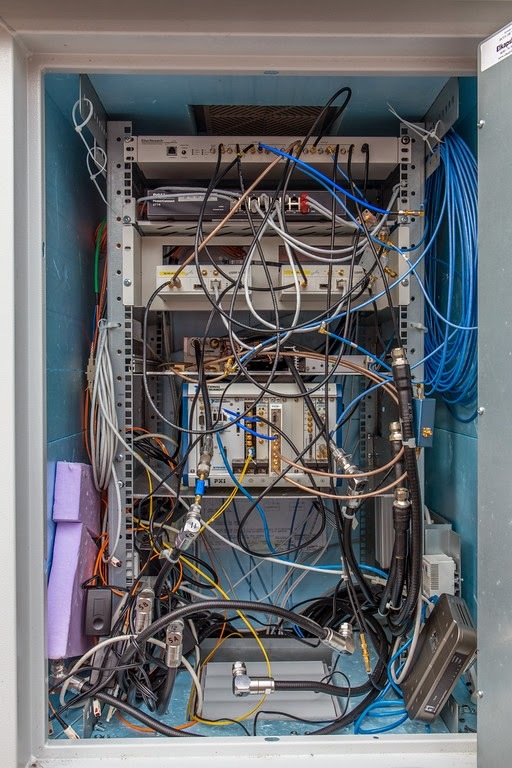 The cost of just cabling connecting the huge number of antennas to a central processing point is significant in recent similar systems (Such as recent developments in astronomy like LOFAR or other precursors to SKA). A first achievement after several months of work, the submission of a first paper is definitely a major step in a PhD student's life. "I have been working on this manuscript for more than half a year", the author Maxime Grandin reveals. "I actually started this project during my Master's thesis, in early 2013. I am glad we managed to continue developing this model thanks to this collaboration SGO initiated with IRAP [Institut de Recherche en Astrophysique et Planétologie] in Toulouse through my PhD." The paper is about a new approach for radio-occultation data analysis, based on the example of the radio science experiments onboard Mars Express. Radio-occultation experiments consist in probing the neutral atmosphere and the ionosphere of a planet using the propagation of radio waves between the spacecraft orbiting the planet and a receiver on Earth. As the radio wave propagates within the planetary envelope, it undergoes a slight deflection due to the varying refractive index of the medium. This deflection can be estimated via the residual Doppler shift which is measured at the receiver, compared to the expected Doppler shift for a straight-line propagation of the wave. 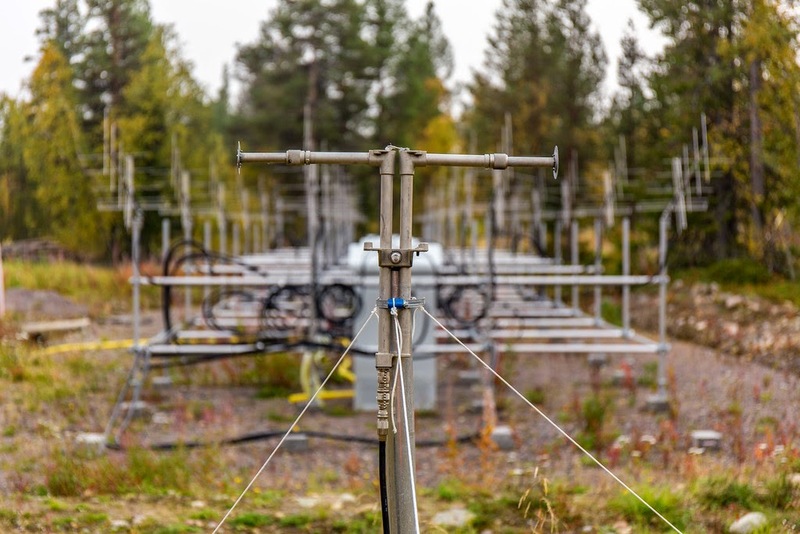 "Usually, such measurements are treated as an inverse problem to retrieve the electron density profile in the ionosphere and the neutral density and temperature profiles in the lower atmosphere," Maxime explains. "But with the coauthors of this manuscript, who were my Master's thesis supervisors at IRAP and ESTEC [European Space Research and Technology Centre, Noordwijk, Netherlands], we decided to adopt a direct approach by simulating the ray propagation between the spacecraft and the ground receiver during an experiment, in order to try to reproduce the measurements." No doubt that the PhD student was very eager to complete this first manuscript of his. Feverishly, as he got the green light from each of the coauthors, he undertook the submission process to a peer-reviewed journal in geophysics. The first paper is a special one, and the author needs taking a deep breath before clicking the final button. 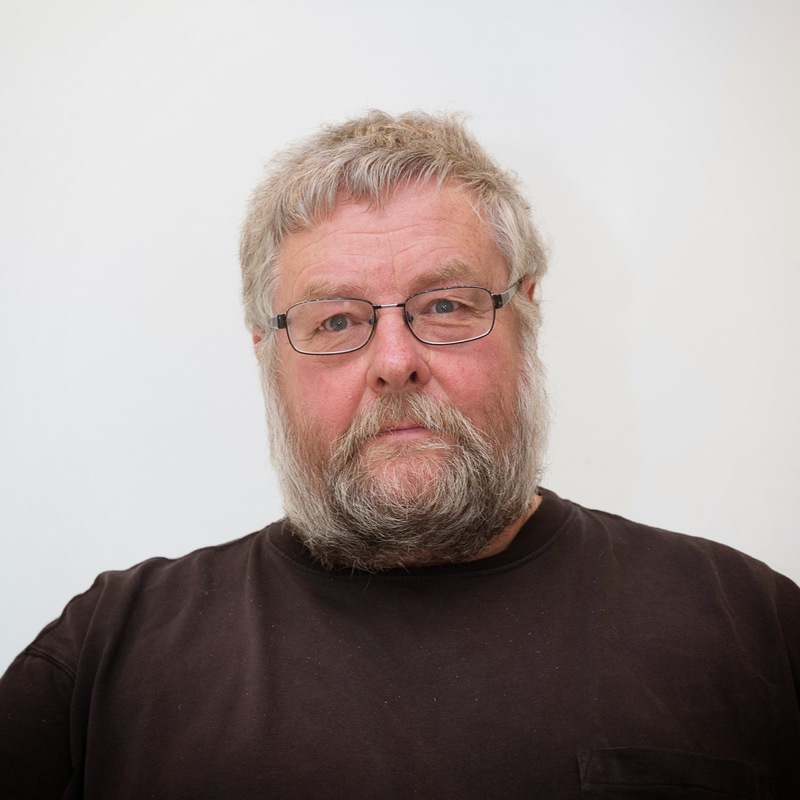 "I published my first paper as a Master's student, in the early 1980s," Esa Turunen recalls. "It was about a model I developed in Fortran 77 to describe the strongly-interacting matter with a two-phase approach. Particle physics! It took two years to complete the model; it was a very complex formulation," the present director of SGO recollects. 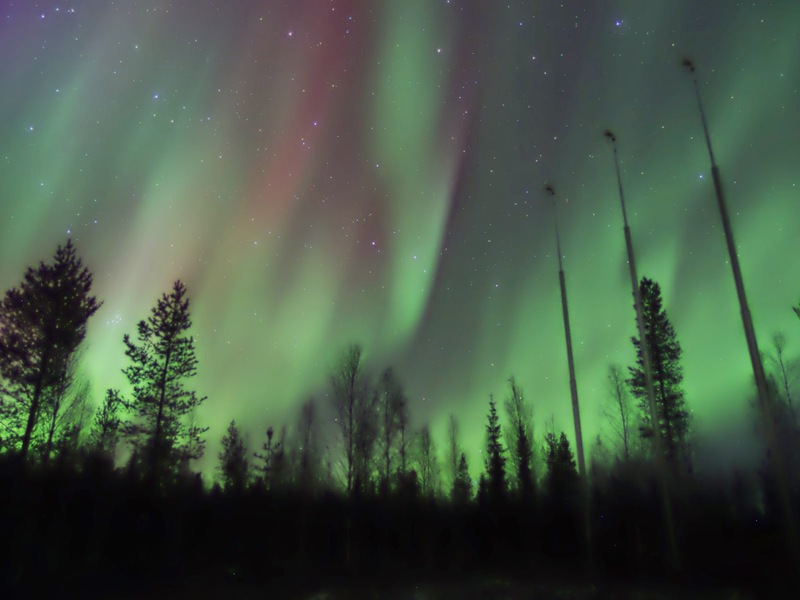 While the reviewing process runs its course, besides checking its status every other hour, the young PhD student will focus on a study about solar wind high-speed streams influence on the high-latitude ionosphere, which may bring him a second paper by the end of this year. Or at least so he hopes. Kiruna Demonstrator Array. Photo: Craig Heinselman. 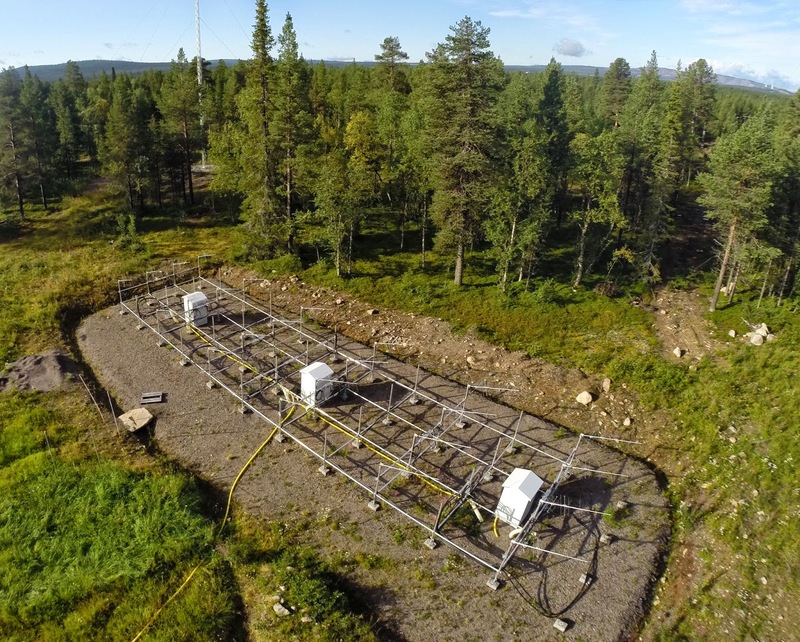 During the FP6 EISCAT_3D Design Study, which was completed in 2009, a small radar receiver array was built at the Kiruna EISCAT site to test reception of radar signals from the Tromsø VHF transmitter using a phased-array receiver. The receiver was used later on for science applications, namely for measurements of so-called Polar Mesospheric Summer Echoes (PMSE). The photo above was taken by EISCAT Director Craig Heinselman using his quad-copter drone, which he demonstrated to his colleagues a day later. One of three instrument cabinets of the Demonstrator Array: this is clearly an experimental setup for prototyping work. The final EISCAT_3D receiver will look much different, probably incorporating many parts into single custom-made components. Photo: Thomas Ulich. 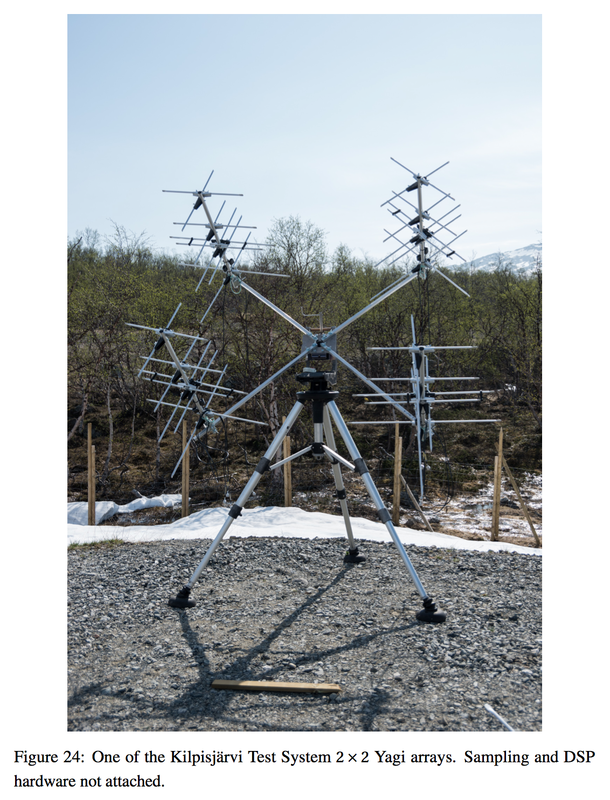 During the FP7 EISCAT_3D Preparatory Phase, the array was modified by SGO scientists in collaboration with Technical University of Luleå and National Instruments to demonstrate reception of VHF signals using a different approach. 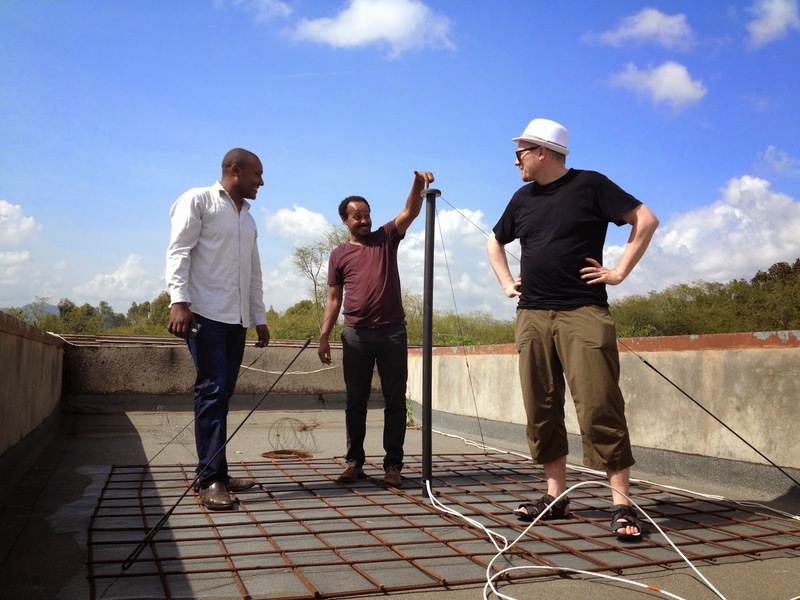 This time the array was converted to using software-defined radio (SDR) receivers. The results of these tests are documented in the reports of the projects work packages 7 and 11 (see Deliverables and Milestones). One of the aerials of the Demonstrator Array with the EISCAT 32-m receiver in the background. Photo: Thomas Ulich. 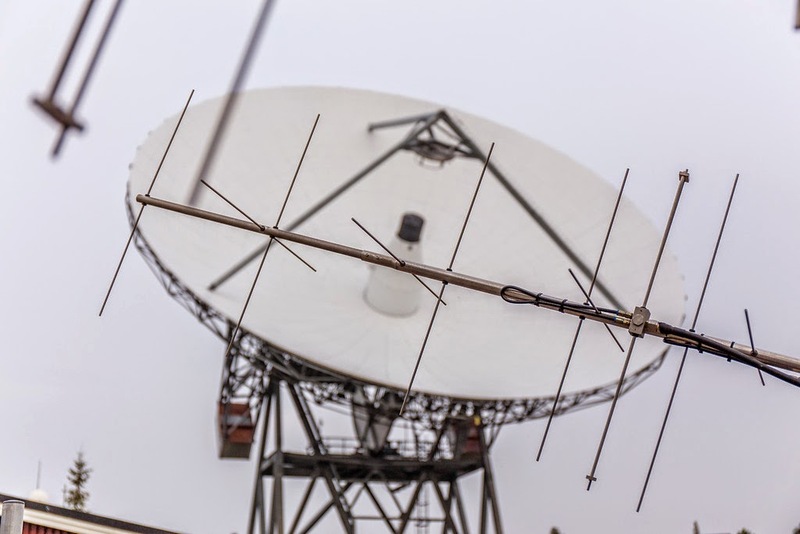 The aerials are derived from TV antennae, since the VHF radar operates at very similar frequencies around 224 MHz. 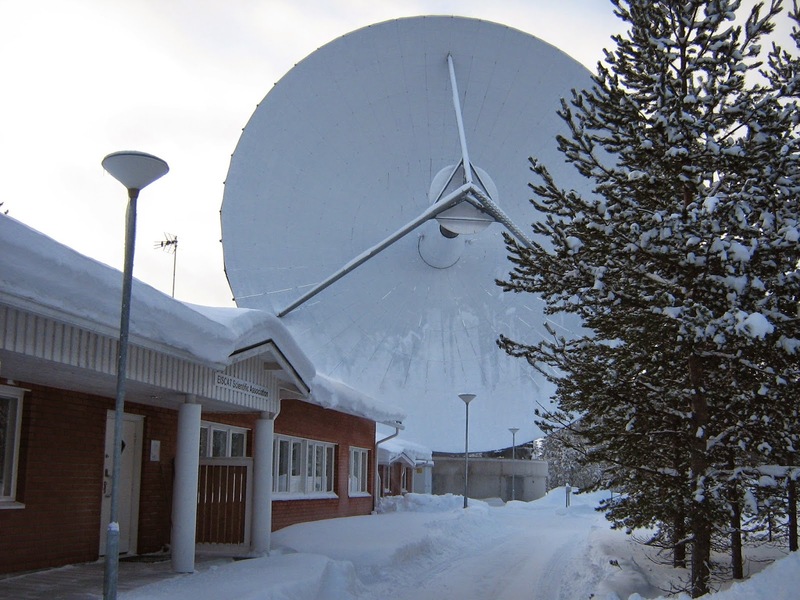 Also EISCAT_3D is expected to operate in this part of the radio spectrum, around 233 MHz, although negotiations about frequency allocations in the Nordic countries are on-going. With the Demonstrator Array in the background, the photo shows a small transmitter antenna, which sends a calibration signal to the array. Photo: Thomas Ulich. Calibration of arrays is essential. The direction in which a phased array looks depends on the time delay of the signals coming in from all of its aerials. Therefore one needs to know the absolute delays introduced by the components of the array, including their manufacturing inaccuracies, before applying delays related to the viewing direction. 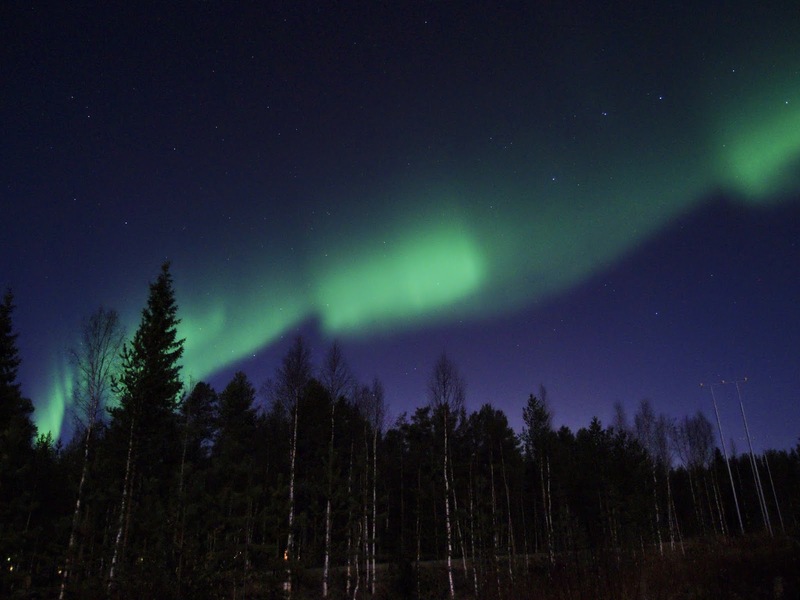 This week, a SGO1 delegation has been spending a couple of days in Oulu. 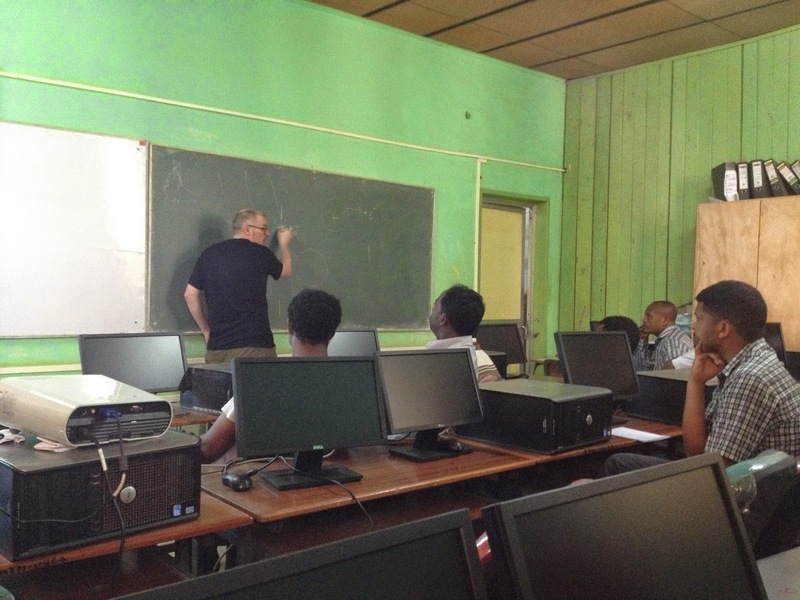 Objectives: sort out study requirement issues for PhD students, discuss about optical measurements, visit the mathematics department, spend a day to brainstorm ideas for the ongoing science projects and even take a course. In the process, we inherited an old instrument which will certainly make a blog post on its own in the near future and we visited the SGO Oulu group. We dedicated the whole yesterday to discuss Derek's and my PhD projects, as all three involved supervisors were present. Many burning issues – such as ECTS2 credits harvesting, follow-up group meetings, DTP3 and PSP4 submission – have been clarified, and still, we had time to discuss about science. I dare say that it was quite a fruitful day. Among the science topics, Derek presented very exciting results about riometer interferometry using the LBA5 array of KAIRA6, while I introduced the radio-occultation model on which I have been working and about which I am about to submit my first paper (see picture). 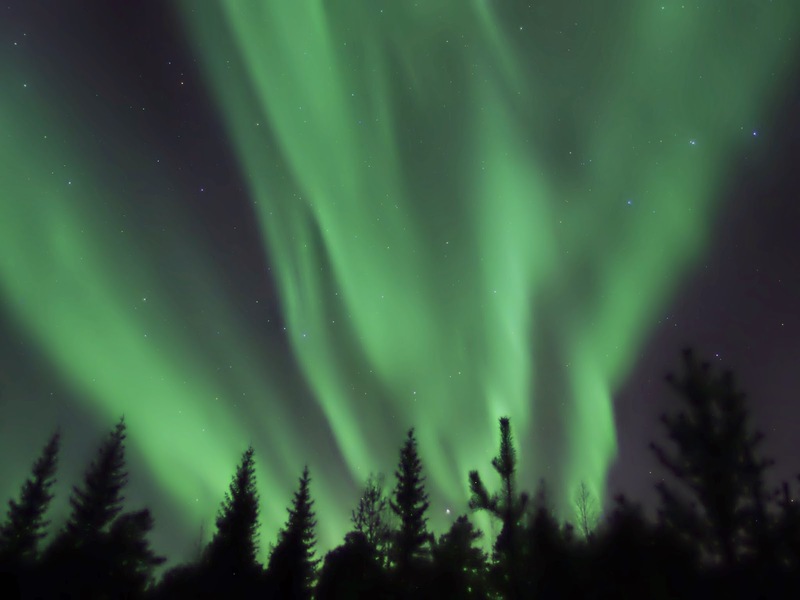 We also quite extensively discussed about the ongoing study of the high-latitude ionosphere response to solar wind HSSs7. More about these studies and results in the coming weeks' posts. Deadline: titles and abstracts by November 27.